Featured image above shows a pot of slimy cactus tea. What is popularly referred to as cactus slime or cactus snot is actually a mucilage. Mucilage is commonly used as a term to describe an aqueous solution of gums. Mucilages are different from gums however in that gums are typically produced in response to injury and are secreted into cavities whereas mucilage is produced inside of highly specialized cells that accumulate it between the cell wall and the cell membrane. Injury to the tissues readily releases stored mucilage but does not produce it. Mucilages are water soluble complex acidic or neutral polysaccharides of high molecular weight. Some components are related to cell wall components such as galactose, arabinose, xylose, rhamnose and galacturonic acid. Mucilages are highly branched and fibrous. This makes them not just large but very sticky and troublesome to handle. Most workers have chosen to work with only the dried outer green layers for this reason. It is not a perfect solution but does dramatically reduce the contribution of slime during preparation for analysis. It also permits comparisons between the work of different researchers who are using the same tissues. Some other workers have employed pectinase (an enzyme) which only partially degrades the mucilage. This can help with handling by reducing the viscosity but it also produces methanol as a by-product of the hydrolysis reaction so should not be used for producing any teas that may be intended for human consumption. Only a few cactus mucilages have been studied, mostly those have been of Opuntia species. In Opuntia ficus-indica the mucilage consists of alternating rhamnose and galacturonic acid residues to which are attached side chains composed of three galactose residues. Arabinose and xylose residues branch from the galactose. It is believed that arabinose is attached to the galatose and xylose is attached to the arabinose. 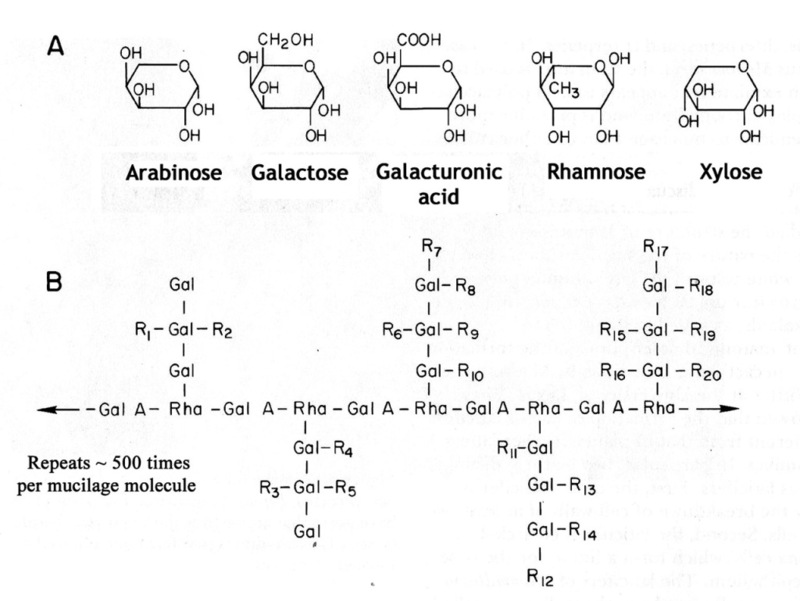 Some galactose side chains have only arabinose and some others have two arabinose residues and one xylose. Other Opuntia species were found to have different ratios of these sugar residues. In Opuntia they were found to act as a calcium storage reservoir. As much as 20% of the plant’s calcium may be associated with its mucilage. This is due to the carboxylic acid moeity of galacturonic acid creating a strongly negative charge (causing the whole molecule to have a net negative charge). Mucilage is highly attractive to water and due to the negative charge can also bind an appreciable amount of their contained alkaloids. B: Tentative proposal for repeating units in Opuntia ficus-indica mucilage. The 20 side chains ® contain around 15 xylose and 25 arabinose residues in total. Adapted from McGarvie & Parolis 1981a-c.
Polysaccharide was 1.6% percentage of total weight of fresh plant. Polysaccharide was 0.53% percentage of total weight of fresh plant. Polysaccharide was 0.48% of total weight of the fresh plant. Polysaccharide was 0.31% percentage of total weight of fresh plant.